"Over the course of two days, Kampong Cham fast became one of my favourite destinations in Cambodia. It oozed charm; an underrated, hard-to-explain-unless-you-are-there-living-it charm that made it interesting. It wasn�t quaint nor was it pretty. We were not hassled nor were we ignored. The emptiness and the calm of the place just had� something. The main highlight of my time in Kampong Cham was the bamboo bridge and the island it led to. I had always wondered why a Khmer friend of mine from the town had once told me about it with such bounding enthusiasm. It turns out this bridge is not only a feat of architecture (re-built every year when the river water subsides during dry season and taken down completely when the tide comes in) but a fun and interesting contraption to cross with your bicycle." Kampong Cham is the third largest city in Cambodia. Despite not having as many tourist attractions as Phnom Penh or Angkor Wat, this charming city is the best place to get a feel of the �real� Cambodia. The remnants of French colonial rule are here, as are modern improvements to this one poor area�s infrastructure. With its Mekong River location and relatively close proximity to Phnom Penh (123km) and Vietnam, Kampong Cham has always been an important trade and transportation hub. The highway from Phnom Penh is in excellent condition-you can get here in just under two hours by road or by the bullet boats that are a main mode of transportation between towns on the Mekong River. The name of the place gives a hint to the local ethnic group living here, at least of the past. 'Kampong' means village (very similar to the Malayan word 'kampung', also for village) and 'Cham' refers to the Champa People. 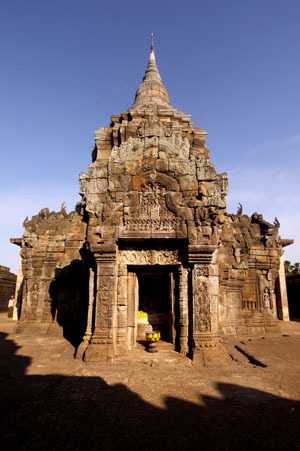 The Champa empire was one of the first empires in Southeast Asia and a long-term rival of the Khmer empire of Angkor. The town itself is quaint and charming with its bustling morning river scene and wide boulevard streets beside the river. There are a few worthwhile attractions nearby and with its location on the way by boat or road to Kratie, Mondulkiri, Rattanakiri and Stung Treng Provinces; it�s a nice jump-off point. Because there is little foreign investment and no massive tourism (almost every foreigner who comes here is a backpacker), this city is quite poor with a few modern buildings, though not lacking in French architecture from the colonial period. 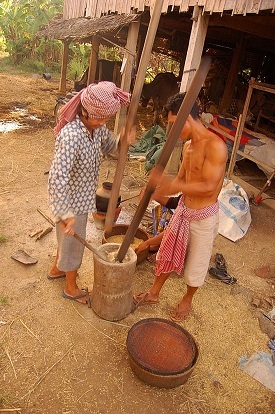 The real charm of Kampong Cham lies with its people. Despite their almost universal poverty and the brutal history of their country, the people of Kampong Cham are mostly friendly, happy-go-lucky folks who are welcoming to tourists. They are very friendly and open to engaging with tourists. Because there is still not much in the way of a tourist industry in Kampong Cham, visitors will have to arrange their own transport. Motorcycle riders will be able to rent bikes, although many tourists take advantage of the cheap prices and purchase their own bike. Non motorcycle riders, and those who don�t want to risk Cambodia�s sometimes crazy roads can find motorcycle drivers (motodops) to drive them. There are also cars for hire. 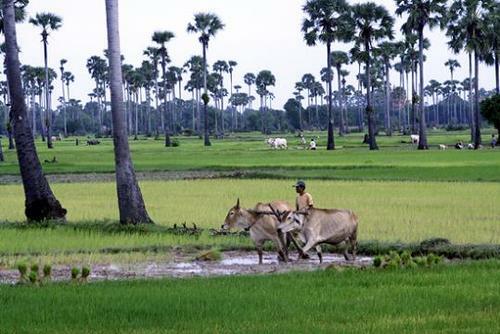 Though there are a few temples, the best things to do in Kampong Cham and the surrounding area (Kampong Cham Province) is just to hang out or cruise the countryside. 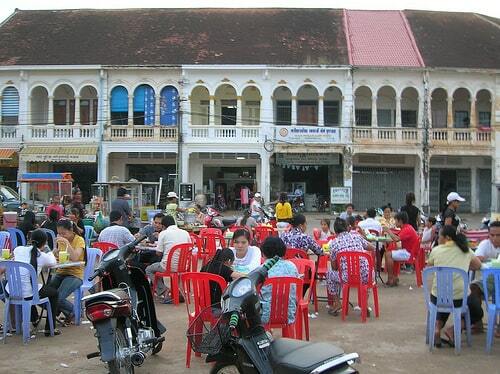 In Kampong Cham city, it is worth checking out the markets. There is all the hustle and bustle of a Southeast Asian market, but with Kampong Cham�s unique charm and friendly local people. 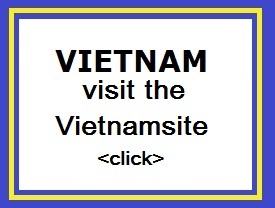 It�s a great place to socialize, even if you don�t speak Khmer. Because this is an outlying area, the food is probably not as safe for a western stomach. However, people who have been in Cambodia for a while, or those who just want to jump in, can find great food stalls at some of these markets. As a general rule, if the place has multiple patrons and seems clean, it�s probably OK.
After a hard day, the improvised beer halls on the banks of the Mekong are the best place to be. Beer is dirt cheap (Angkor, Tiger), and the locals will definitely be around to socialize. Just cruising in the countryside, along the fruit and vegetable farms, and local villages (including several stilt house villages along the Mekong) is interesting for most tourists. Those seeking "untourist" attraction will find a couple of temples in the area worth checking out. Thousand year old Nokor Temples is the most famous in the area, but be prepared to wander by yourself unless you happen upon one of the monks who live there.